FAYETTEVILLE, Ark. — One year after Andrew Benintendi made a run at the American League Rookie of the Year award, another former Razorback is doing the same this year in the National League. 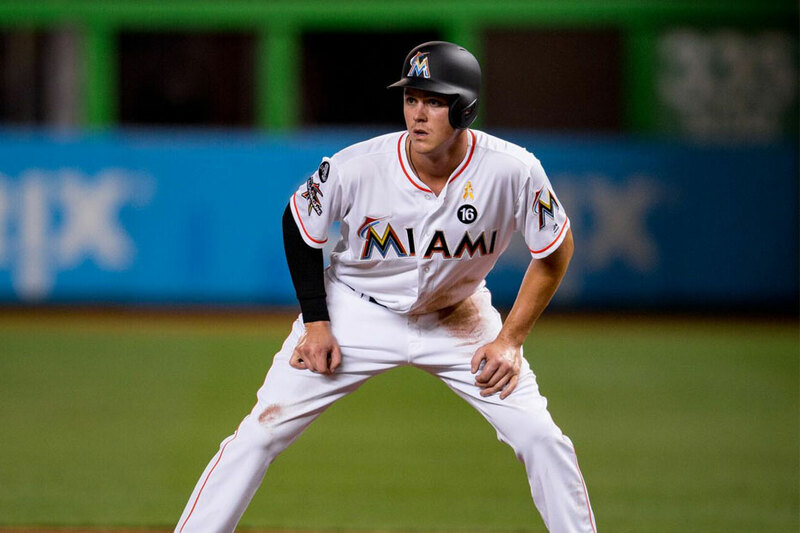 Miami Marlins infielder Brian Anderson, just four years removed from his last game in a Razorback uniform, seems to be turning into a cornerstone for the Marlins organization in the midst of a total rebuild. Anderson is hitting .288 in 97 games with 109 hits, eight home runs, and 49 RBIs, while splitting time at third base and in the outfield. He’s also the first Marlins rookie in the 25-year history of the organization to have 100 hits before the All-Star break. The idea of Anderson competing for the Rookie of the Year is not far-fetched. He’s only fifth among NL rookie in batting average, but has played the most games, leads all rookies in runs scored (55), hits, doubles (23), RBIs, and is second in on-base percentage (.404). He also has the highest wins above replacement (WAR) among all rookies in MLB at 2.3. It seemed former Razorback and National Player of the Year Andrew Benintendi was primed to earn his first All-Star nod with the Boston Red Sox this year, he just needed the fans to provide some extra votes. In the midst of his second full season with the American League East-leading Red Sox, Benintendi finished second to Seattle Mariners shortstop Jean Segura in the MLB All-Star Final Vote contest. Regardless of the snub, Benintendi hits the break in the top-15 of the AL in batting average (.297), hits (104), doubles (25), walks (49), stolen bases (17) and OPS (.897). After a slow start to the year, Benintendi has the third-highest average on the team among players with 50 or more at-bats and is hitting .311 over the last month with nine of his 28 hits going for extra-bases. It’s been an up-and-down season for the World Series-champ, but Dallas Keuchel continues to be a staple in the Houston rotation and looked to be having his best stuff in his last three starts before the All-Star break. Keuchel went six or more innings in victories over Texas, Detroit, and the Chicago White Sox to move to 7-8 for the year with a 3.75 ERA. In each of those starts, Keuchel didn’t give up more than two earned runs and only walked five batters combined. Keuchel is scheduled to start Houston’s first game out of the All-Star break at the Los Angeles Angels on Friday. First pitch is scheduled for 9:07 p.m. CT.
Former Razorback position player turned journeyman MLB reliever Blake Parker has, seemingly, taken over the Halos closer role, for now. Parker has locked up seven saves in his last 18 appearances, including six in the month of June. The 10 saves leads all Angels relief pitchers and is a top-14 total in the American League. With injuries to Keynan Middleton and Blake Wood, the Angels are in the market for more relief help before the trade deadline and, hopefully, earning Parker more save opportunities.